With my love for small family run restaurants, I wish… just wish … I could rave about Maiz. 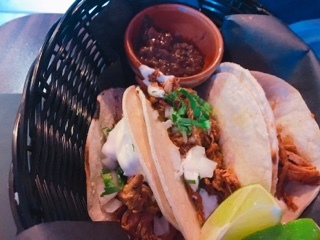 The restaurant has the makings of what could be a niche neighbourhood spot: it’s the only one in the area serving Latin food, the dining room is casual but comfortable, and with the roll-up windows and dark décor it has a Queen West coolness. If only they didn’t push the arepas ($11) so much. Having had them delivered through Ubereats and at the restaurant, they certainly taste better in person. Yet, despite the amount of pulled chicken, guacamole, and cheese stuffed into the maize flour toasted shell, the pastry was still tasteless and dense. Perhaps if it were fluffier, thinner, or contained more salt in the dough it'd be better. 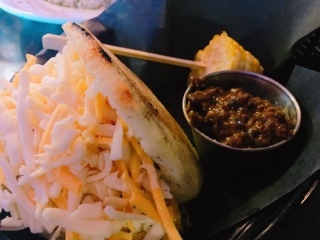 The thick la negra salsa, which is dark and flavourful like olive tapenade, could have helped augment the arepa if it weren’t served so cold, shocking the taste buds. 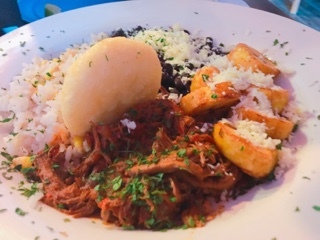 The pabellon ($15) is better, especially if you need a filling meal. 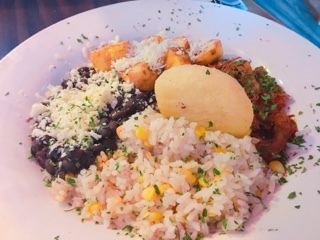 The plate is heaped with black beans, rice, fried plantains, pulled beef, and a miniature arepa. The actual protein was decent and has a lovely hint of spice in the background, but I still prefer the pulled chicken, which is more succulent and flavourful. Overall, the dish really needs something saucy and the pulled beef is where the moisture comes in; everything else (except the rice) was dry and heavy so it screamed for sauce. 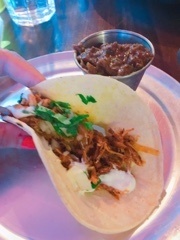 I’d go back for the corn-shell pulled chicken tacos ($12 for three), which could easily be made into a meal with a shared appetizer or side. Although simply adorned with cilantro, onion, and sour cream (we added oaxaca cheese for extra $1.50), they were tasty and the perfect three bites. I always try to order the “traditional” dishes during a first visit to a restaurant. Therefore, it could be a shared disappointment in Maiz and me that I didn’t like the arepa and pabellon more. Instead, it was the mainstream tacos that won me over. Oh well, the stomach wants what it wants.